Level 3 was a bit of a mash up between Level 1 & 2. It began with another day of learning as per Level 2, followed by the long days sailing and long nights sleeping of Level 1. Limited wind, limited drama, sunshine and A LOT of learning meant it was a good way to spend a week! I’ve returned a whole lot less knackered but looking a whole lot more like a teabag for it. The first day of Level 3 was spent in a classroom learning the official ISAF way not to die. Needless to say, quite a lot of sugar and coffee was required to stay alert through the day, but after several hours of numb bum syndrome, it was back to Gosport Marina. 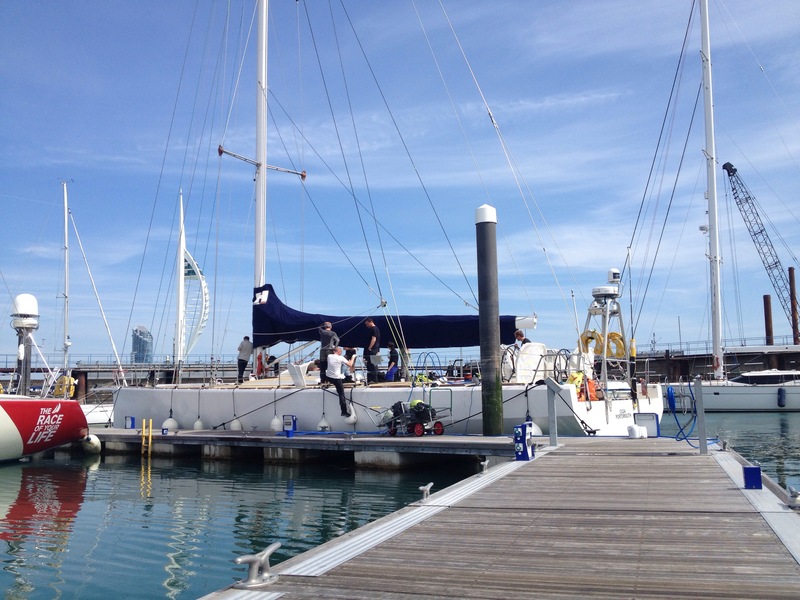 This week we were staying in the very Clipper 70ft yachts we’ll be racing around the world in – no more tiny 68ft boats for us. Each day we woke up at 6.30am for a rather early breakfast at 7am before heading off sailing for the day, returning sometime after 9pm. The theme for this week was repetition: hoist hoist hoist, tack tack tack, gybe gybe gybe, drop drop drop but STILL I managed to get something wrong pretty much every single time. Asked to lead something: got it wrong. Asked to solve a problem: got it wrong. Asked to hop on the pedestal and spin my arms furiously: now there’s my niche! I definitely think I’m better suited to being an obedient rower in this situation rather than the cox. I’m consoling myself that at least its better to make these mistakes cruising the Solent rather than racing across the Atlantic. Think it might be a bit more important to get it right then. “Apple chat” – an example of the many comedy moments experienced on the boat. As a result of this, I’ve decided than Sean from my crew is an ideas machine and that Huw is definitely good value when it comes to amusing conversation. Helming with the Spinnaker up – this is basically the huge sail you can have at the front of the boat that puffs right up. I really enjoyed helming during my previous 2 weeks of training, but it was a different kettle of fish with this flying. The challenge was to keep the sail inflated at all times; move too far one way and it would deflate. Move too far the other, and it would deflate. Was definitely feeling the tension with that sail up. Wooling & singing – after the mild peril of managing the spinnaker whilst it was flying, each time we retrieved it, we had to stretch the damn thing the length of the boat, roll it up, then tie it with wool every meter or so. As fun as this sounds, it was made even more so doing this at the front of the boat below decks, the result being two of us feeling a little queasy whilst sail-wrangling. The upside of this was that I discovered singing helps fend of sea sickness for me. Unfortunately, the only songs I could think of were Enya “Sail away” and “Tequila, it makes me happy”. Level 3 was indeed a musical mash up. Tying one-handed bowlines – given that I used to really struggle doing this knot with two hands, I now feel like a pro being able to tie a loop around myself with one hand. Good if I end up off the boat needing to tie myself back on. Bad if I end up off the boat trying to tie myself back on and accidentally chop my hand off in the process of doing so (quite likely). I’m going to stay on the boat and save that knot as a party trick instead. Lovely view of the boat being deep cleaned as I nursed my head. Fool. Stepping up into the boom – wouldn’t recommend this one. I ended up spending my last hour on the boat with an icepack on my head after walloping my head. I think I may be genetically pre-disposed to this as my dad has a sailing helmet, he’s hit his head so often. Calamity Hartwell. Finally, the thing that’s really made all of these training weeks so far are the people I’ve met. It’s amazing how quickly & easily you get on with people literally all in the same boat, even when you release the full crazy (important that my future crew-mates are prepared). 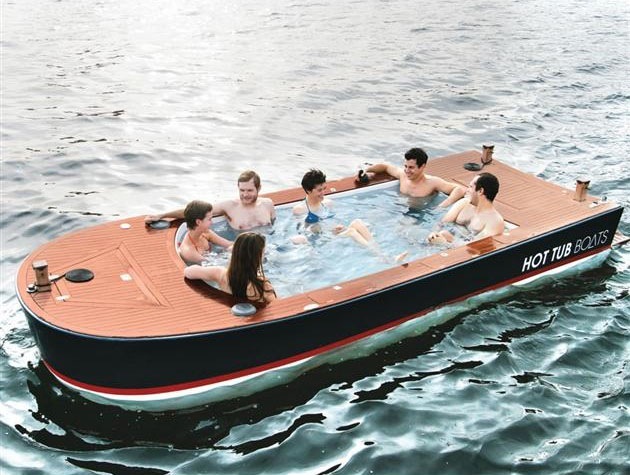 For example, Ros & I took up the comedy challenge of coming up with ever increasingly ridiculous things that we should buy for the boat from the crew fund (Ros, this makes you a most excellent person). Our future skipper despaired at this somewhat, but unfortunately for him, it only made it more amusing. So far we have planned an on-deck jacuzzi with gazebo to go over the top and drink cocktails in. Clipper 70 Post-Jacuzzi installation. Only minor modifications required. I also suggested a stopover challenge for crew to dress up as ninjas and trophy other team’s mascots (a fair bit of wine had been quaffed by this point). Unreasonably, Huw was not impressed. I think it’s a cracking idea. I’m now off to find 22 ninja suits ready for team building in June before returning to Gosport for Level 4 in August. It’s going to feel a long 2 months before I get on a sailing boat again; can’t wait for final week of training! This evening, it hit home to me how I’ve begun to learn a whole new language without even realising it. It came to me as I was sharing the dark arts of rowing with newbies at my rowing club. I’ve been rowing since I was a teenager, so all of these terms are deeply embedded in my memory. Its completely obvious what they all mean. Isn’t it? Today, I was reminded how the rowing lingo I take so much for granted was like a whole new language to the people I was teaching. That it takes time to get your head around it and really understand what the terms refer to – just like it was for me during my first level of training for the race. The difference between rowing and sailing, however, is the SHEER QUANTITY of new terms you have to learn. Take the parts of the boat, for example. I used to think rowing could be a bit complex, but my perspectives have now radically changed! I’m not the most patient of people so I can sometimes find it a bit testing teaching rowing. 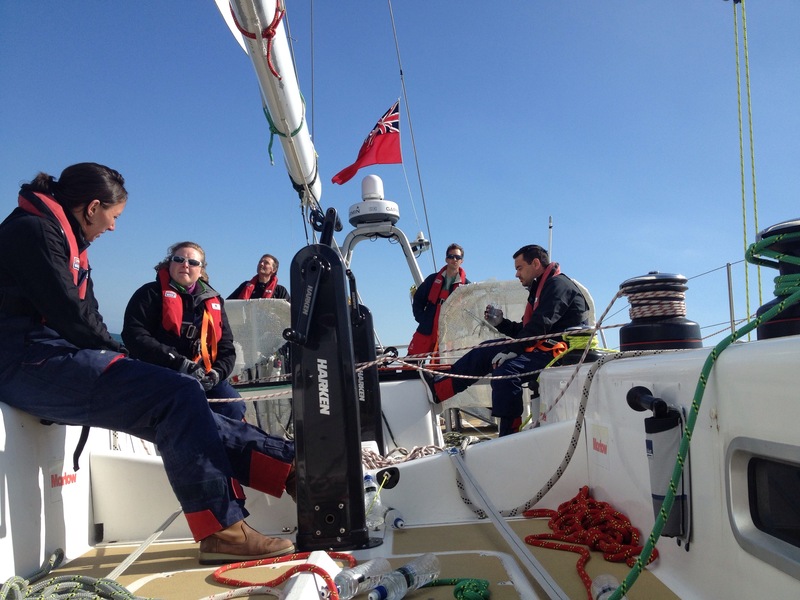 How our skipper and first mate had the patience to teach 10 of us how to sail a 68ft yacht from scratch I’ll never know! The upside is that having recently learnt something completely new, I really appreciated today how patience and clear explanations from your instructor make a difference. It completely makes the learning experience (or breaks it – I hope I don’t find out on level 2!). I’ve now just got to crack on with remembering and surely learning lots of new terms as part of this sailing experience. The top picture is a brain-dump of what I’ve learnt so far from just one week, although I’m pretty sure there is a lot I’ve missed off. My Level 2 training is now just over a week away so I’ll soon be back on board with plenty of time to practice it all again soon. 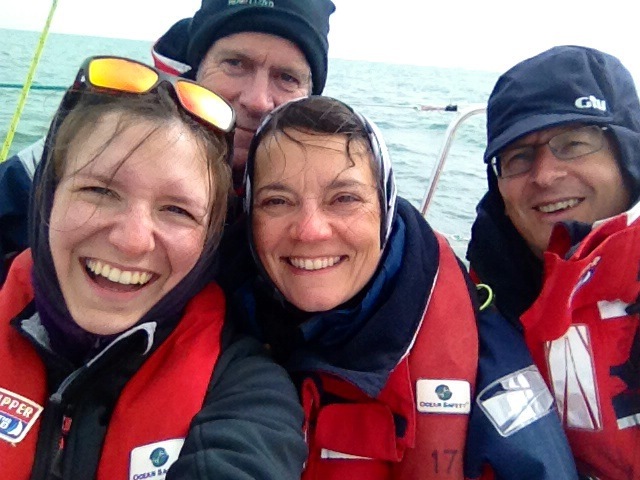 So, the first part of my Clipper race adventure is over! Last week, I completed the first of 4 weeks worth of training I have to complete this year. 1. That it would be so much fun! The crew on CV3 (our 68ft floating home for the week) was absolutely great and completely made the week. Not to forget Emily our Skipper and Paul as first mate. We were pretty much constantly laughing. Inhibitions were lost pretty damned quickly which helped, so much so we became the “party boat” out of the 2 level 1 crews sailing that week. Hilarious. Not just for late nights in dodgy clubs apparently (not that I’d know – thanks Sam!). I’ve learnt a whole new language over the last week, and apparently only just scratched the surface. Luckily, there is a large helping of innuendo with many of them so it was highly amusing for all on board. This is mostly for the sweating and grinding (to hoist the sails!) and for lifting the very heavy sails & ropes on deck. On the command of “2, 6 heave” we managed to moved things between us, but it was seriously hard work. The Circuit training that I do for rowing paid off, but more upper body strength is required. Time to build some guns. Alongside that, the system of lines and knots needed takes some time to get your head around. Spatial awareness has definitely been improved after just one week. 4. That MK is apparently so dodgy that dangerous parts of the boats are named after it. Boo 😦 clearly no one in my crew had ever visited properly. “But I’m not actually from Milton Keynes, i’m from a village outside it don’t you know”. I think my protests just confirmed their suspicions. Every single meal or break involved biscuits or pasta. Now this no bad thing, carbs being my favourite food and lots of energy being required. I am, however, looking forward to veg this week (having just had more spag Bol back on land). 6. You will be physically punished. And not just by being made to clean disgusting bilges on the last day. Through a combination of scrambling around on deck, handling ropes and lifting heavy objects, I am battered, bruised and aching, not to mention weather beaten. My hands and knees in particular felt the strain, but quads hurting too today from all bending and lifting. Ow. During training, I really didn’t feel hugely tired. Yes, I was weary at the end of each day, but I felt pretty chipper each morning despite some late nights. This was no doubt helped in part by my super cosy sleeping bag (still on love with it), but on reflection, I think I was running mostly on pure adrenaline. I know this because today I feel like I’ve been hit by a truck. Things didn’t stop swaying either until this evening. Positively falling asleep at my desk today despite being back on land. The super-snug yellow beast in action. There’s so much more I could and hope to write about level 1, but DOKS is compelling me to sleep. Thanks must go to Jen for the photo of me on the deck – possibly the only one of me actually doing something related to sailing!